Pallets are flat transport structures which are used to stably support goods. They can be lifted easily with aid of a forklift or front loader. 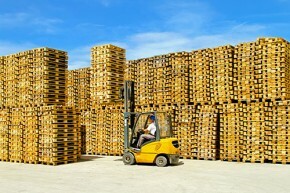 Pallets are similar to a skid in that they are used for shipping. However, skids do not have bottom deck boards. Pallets are traditionally made out of wood. However, pallets can be made out of metal or plastic and other kinds of materials. Each of these materials have their own advantages and disadvantages compared to others. Reardon Pallet Company, Inc. is committed to providing quality pallets to businesses that have a product that they need to move. Give us a call today at (816) 221-3300 if you are looking for a new shipping solution for your company.